So, let's start with the inspiration. This is from Engineered Garments of Brooklyn, NY. Their editorial photo spreads are horrendous IMO, but the clothes are beautiful. I had a chance to see them at Napenthes, a store WAY too hip (and expensive!) for me in NYC's Hell's Kitchen neighborhood. Essentially, everything they make is about 10 times more than I would/could ever afford. Just add a zero to the price of anything and you're there. 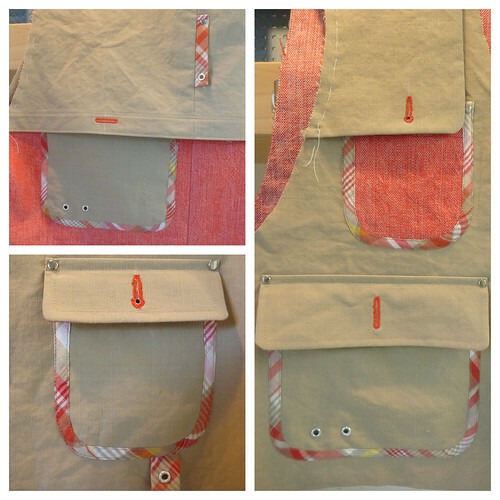 In these instances, being able to sew is a huge advantage. After seeing the genuine article I was convinced that I could duplicate the look for a song. More inspiration. These vests are by Junya Watanabe, his Spring 2014 collection. I love all the pockets and asymetrical detailing. A patchwork vest on Mr Porter is almost $1200. Mind boggling. So... The Plan. -- Make a Watenabe inspired vest that can be worn over my knockoff Watenabe jacket, or on its own. I found this pattern on Etsy and was convinced that it would be perfect. I wish I had the pictures to prove it, but I couldn't have been more WRONG! I made a quick and dirty muslin, and try as I might, I couldn't get it to fit. 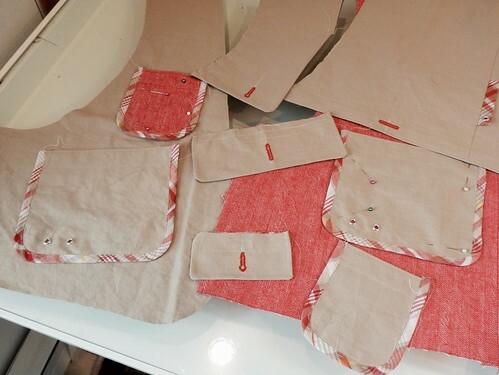 I was folding it up at the bottom, folding the fronts over, putting darts in the front and back, taking in the side seams, narrowing the shoulders. It was a mess, and way too frustrating to photograph. After wasting an enormous amount of time I finally came to my senses. A true WTF sewing moment if ever there was one. Why didn't I see that I could easily have drafted my own vest pattern based on the front and back pattern pieces of the jacket???? For some reason I've convinced myself that drafting a pattern is beyond my ability. Foolishness. 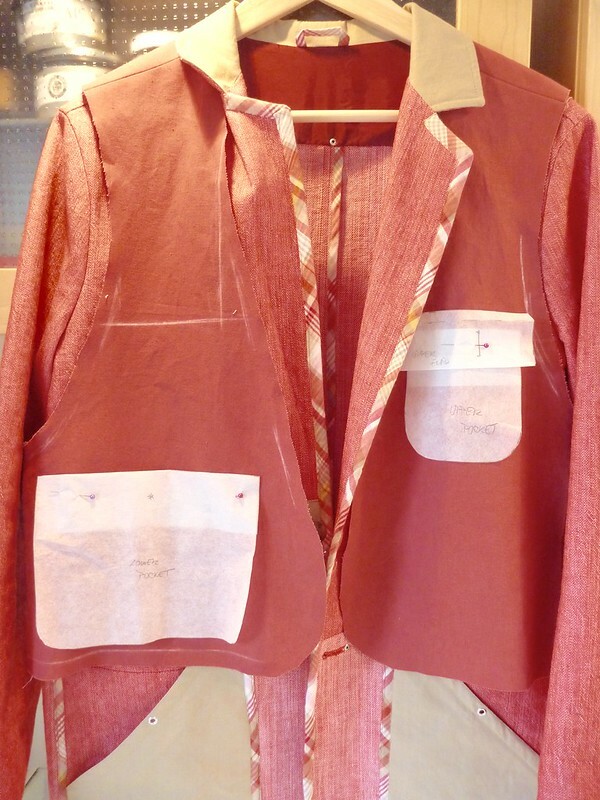 Within a few minutes I'd traced out a vest shape over the jacket pattern pieces and whipped up a perfectly fitting muslin. I set about making all the bits and pieces. Sorry, McCall's 7816, I guess I don't need you after all. I'll gladly send this pattern to anyone who might like it. It's huge, I can barely stuff it back into the envelope. Vest, shirt and trousers -- sizes 40, 42, 44. 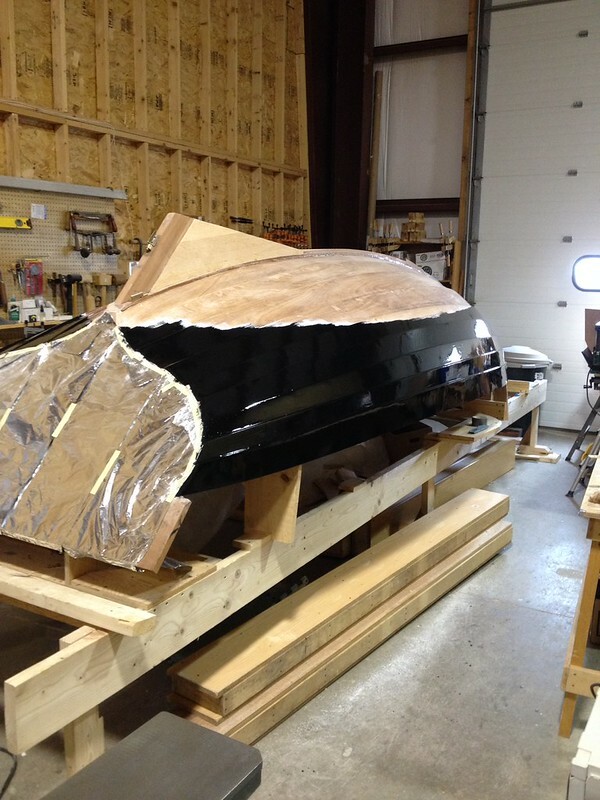 The first coat of topside paint is going on the boat. Funny that I dislike black clothes but love black boats! Next time a completed vest, and maybe a coat of bottom paint. It is going to be an amazing vest AND amazing outfit! Regarding your comment on my blog: Thanks! You are lucky that your yard is fenced in. Usually I take my pix in my back yard but I waited too late that day and the backyard was already full of shadows. I felt pretty "exposed" in the side yard! Impressive drafting and sewing - so nice when we realise that our skill levels are way above what we think they were. Congratulations! 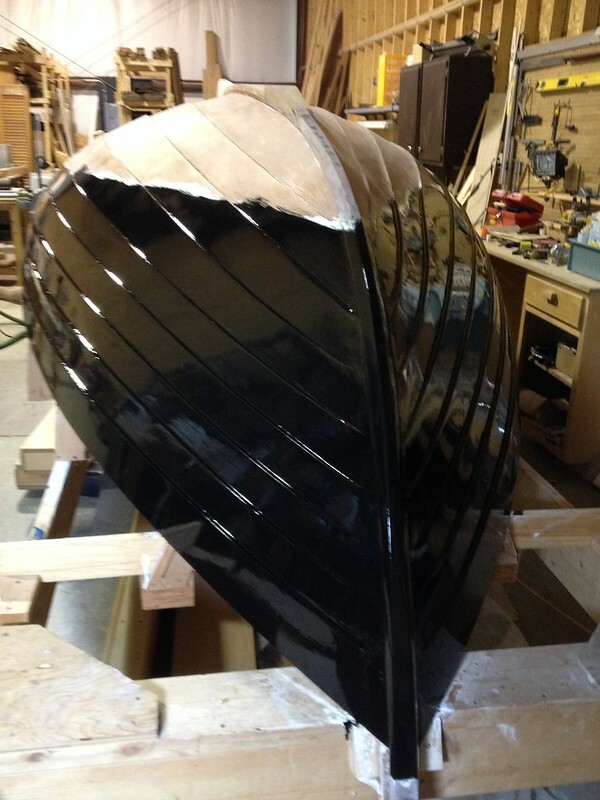 It's almost a shame to cover up the beautiful wood with the black paint but the boat is looking awesome! Your vest "sage" gave me a little giggle. I don't think there's anything you can't do when it comes to makery (word?) ... you seem to have an eye and talent for it, so trust yourself more. Welcome to the world of pattern drafting. I do the same technique to knock off high end rtw. You are doing the exact same thing I do to make hip clothing. Congratulations, that combined with your cool fabric choices and your impeccable constructions techniques (a la singer 301) you got "stylin" goin on, big time. I looked at the clothing on pinrest from your link above, they remind me all the clothes and patterns in my japanese pattern book, easy to knock off and make yourself. It's one of sewing's little epiphany, I'll raise a glass to that! That boat!! That vest!! That's some very nice work and I'm looking forward to seeing both finished. What type of oil-based paint are you using and are you thinning with spirits? It looks fantastic. I'm curious re. the title of your post, "What the F was I thinking". The 'F'...could you be more specific? I'm using Pettit Easypoxy, a one part polyurethane paint. http://www.pettitpaint.com/m/product_mobile.asp?id=45. It was very easy to apply. I rolled it on and then tipped it off with a brush. I didn't see any need to thin it. What fabrics are you using for the vest, is that a "rip-stop" sort of fabric (tan)? Actually it's a cotton poplin with a grid texture. I bought a lot of it because it doesn't have any stretch. I'm hoping to make a pair of shorts and a pair of trousers with it. It can be a challenge to find decent bottom weight fabric without stretch. "For some reason I've convinced myself that drafting a pattern is beyond my ability. Foolishness." Email me at kris.replogle@gmail.com and I will reply promptly. no doubt this is the most wonderful luxury brand further that's phenomenal Japanese Pattern thanks for share with us.